I guess I've learned to pay attention to what my mom remembers. That helps me know what really matters to her. Did you ever wonder why the deeply forgetful can remember some recent events and future plans but not others? I wonder that all the time. Why do some memories form while others fail? Hmmm. When I was learning how to teach art to elementary school children, I had to learn how we learn, how we remember and how we know. It turns out that we “know” in many more ways than we would expect. Art, for example, is a way of “knowing” the world – both making art and looking at art. We can “know” in many ways apart from reading, writing and talking. We also make stronger memories when two different areas of the brain are involved – words and music together for example. I for one can remember every word of every coffee commercial that was out when I was a child (“Chock full of nuts is that heavenly coffee”...). I found out about the importance of the aesthetic experience – something you experience with all of your senses and faculties and emotions make stronger memories with more connections in the brain. I guess I knew all of this in theory but then one day, last Fall for the first time in her life, my mom, Pauline, at age 89, fed a horse out of her hand. This was over five months ago. She remembered it that day, the next day, and has talked about it consistently since. 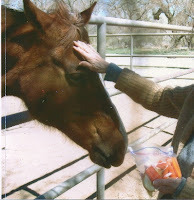 She even wrote about it in a letter to her grandson – how gentle the horse was and so nice and he could have bitten off my hand if he wanted to but he didn't. So, apparently the deeply forgetful can be very rememberful when the conditions are right. They don't remember that they ate breakfast? So what. Maybe the fact that they ate breakfast isn't that important after all. It didn't have an impact. Maybe by forgetting certain things they are teaching us something – what really matters in life at the end of the day. I guess I've learned to pay attention to what my mom remembers. That helps me know what really matters to her. I try to help her create new memories that can only be formed with all of her senses and emotions I try to help her live an Aesthetic Life.